What is Hairball Plus Chews for Cats? Hairball Plus Chews for Cats is a chicken-liver flavored soft chew, exclusively from 1-800-PetMeds to help reduce bothersome hairball problems. Hairballs are not only a nuisance, they can also be detrimental to your cat's health. The coughing, retching and vomiting associated with hairballs causes your cat discomfort, can interfere with proper digestion of nutrients and even creates a choking hazard. 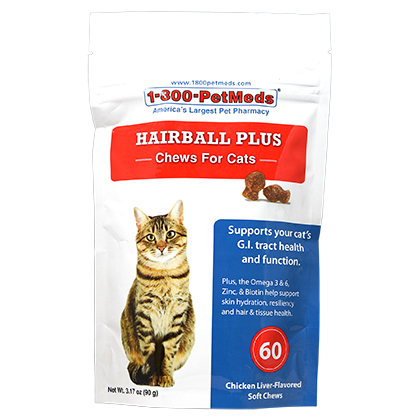 Hairball Plus Chews for Cats is loaded with Omega 3 & 6 fatty acids to help support your cat's G.I. tract. It also contains zinc and biotin to support healthy, resilient skin for less shedding. As well, Hairball Plus Chews for Cats contains Psyllium seed husk powder to help ease the movement of ingested fur through your cat's digestive tract. Giving your cat Hairball Plus Chews for Cats can help reduce hairball problems and diminish housekeeping woes associated with their clean-up. Hairball Plus Chews for Cats is loaded with Omega fatty acids, zinc, and biotin, to support skin hydration and resiliency and hair and tissue health. It also contains Psyllium seed husk powder, a soluble fiber, which helps move hairballs through the digestive tract. Best of all, Hairball Plus Chews for Cats is easy-to-administer, since it comes in a fish-shaped, chicken-liver flavored chewable most cats love. For pet use only. Keep out of reach of children. Hairball Plus Chews for Cats is a tasty soft chew that supports your cat's G.I. tract health and function. Can be given to your cat daily. Your cat may view this as a treat, so make sure to keep the bag away from him or her to avoid over consumption. Other Ingredients: Natural chicken liver flavor, oat flour, rye flour, brewers dried yeast, oat meal, arabic gum, water, flax seed oil, glycerin, soy lecithin, maltodextrin, sodium alginate, dried whey, salmon oil, psyllium seed husk powder, citrus pectin, safflower oil, calcium sulfate, cranberry powder, sorbic acid (a preservative), zinc proteinate, propionic acid (a preservative), natural mixed tocopherols (a preservative), biotin, papaya (a source of papain). ¹One USP Unit of Papain activity is the activity that releases the equivalent of 1g of tyrosine from a specified casein substrate under the condition of the assay. This product contains sources of Papain (hydrolyzes protein).